The one handed typing tutor. Learn to touch type with one hand. Suitable for child and adult. One handed typing helps people with a disability in education and employment. Become a one hand typist. at the affordable price of US$85.00 (includes postage). 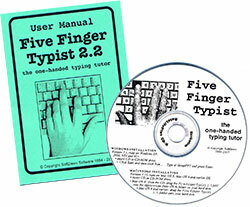 You can purchase Five Finger Typist on-line direct from the developer, SoftDawn Software. Five Finger Typist can also be purchased from a number of distributors in different parts of the world. You should check with your local distributor for their price in your local currency. You can order by e-mail, or by post and pay by cheque, or postal order. With your order please include your name and postal address for delivery. 5 Dudley Street, North Fitzroy, 3068, AUSTRALIA. Orders will be filled promptly. Please allow for airmail to European and North American destinations which takes about 7 to 10 days from Australia.